The Native Instruments Traktor Kontrol S8 is the ultimate Traktor Pro DJ controller if you are into STEMS and Remix Decks. The Traktor Kontrol S8 has been around for a while now. 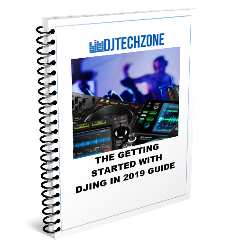 In fact, it was one of my first articles here on DjTechZone, and we are talking September 2014! It’s quite amazing it took me this long to review it, but it’s even more amazing that this controller has managed to stay relevant for so long. Beginning 2019, I want to find out if the S8 is still worth buying. The short answer is yes. 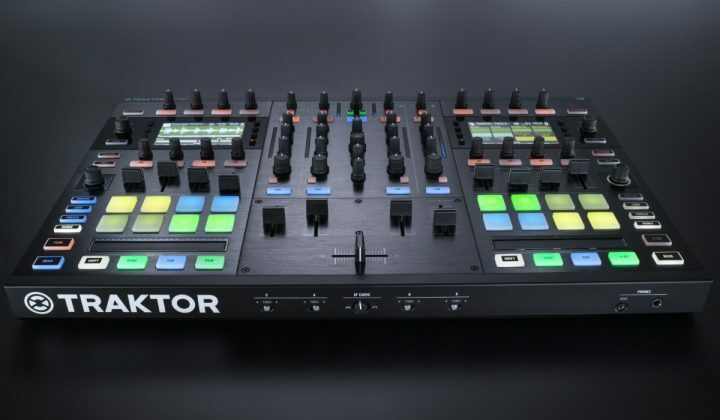 This is a fantastic controller for Traktor Pro 2 or the new version Traktor Pro 3, and if your DJ workflow consists of using a lot of STEM files combined with Samples, Remix Sets and electronic tracks thrown into the mix, the S8 is the perfect workhorse, even today. The build quality is solid. The S8 has an all-metal body and feels heavy, and that’s exactly how I want a professional piece of DJ gear. STEMS: Trying to blur the line between producers and DJs, Native Instruments introduced the STEM file format a few years ago. It’s essentially a multi-track format that splits a song in 4 instrument groups, usually vocals, drums, bass, and melody. This can vary according to the track. The file is a regular mp4 file, and when loaded into compatible software (for now only Traktor Pro), you can manipulate each STEM track separately. REMIX Sets: Remix sets are a collection of samples that together form a coherent track. 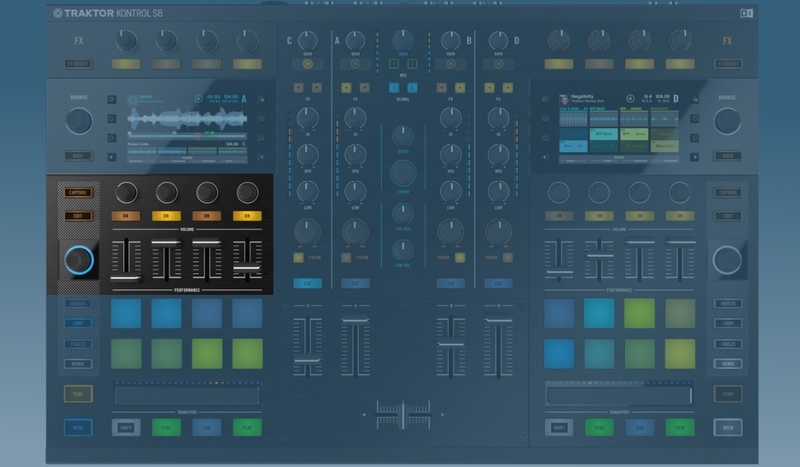 These sets can be loaded into Traktor Pro’s remix decks, and from there they can be easily synced and used to create remix versions of tracks. You can see them as a more complex version of STEMS. The Traktor Kontrol S8 is designed with STEMS in mind, as the 4 faders per channel are perfect to control the volume of each individual part of a STEM track. But is it worth the price if you don’t care about STEMS or Remix Sets at all? Let’s find out! 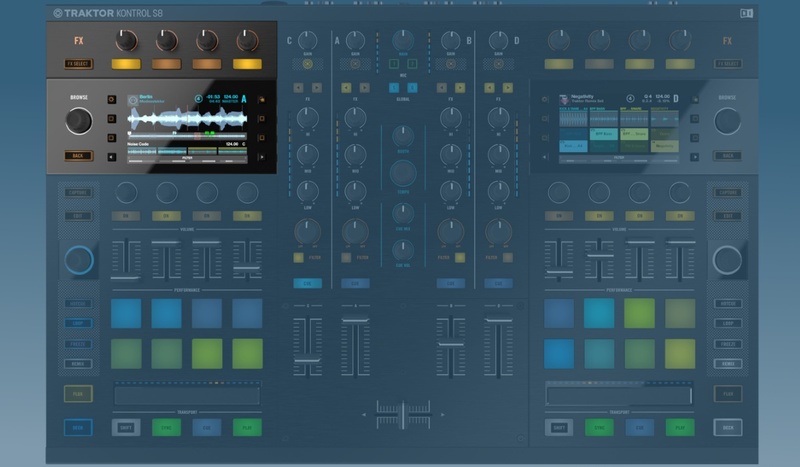 The high-resolution screens on the Traktor Kontrol S8 are simply great. They are not that big, but the sharpness and display quality make up for that. 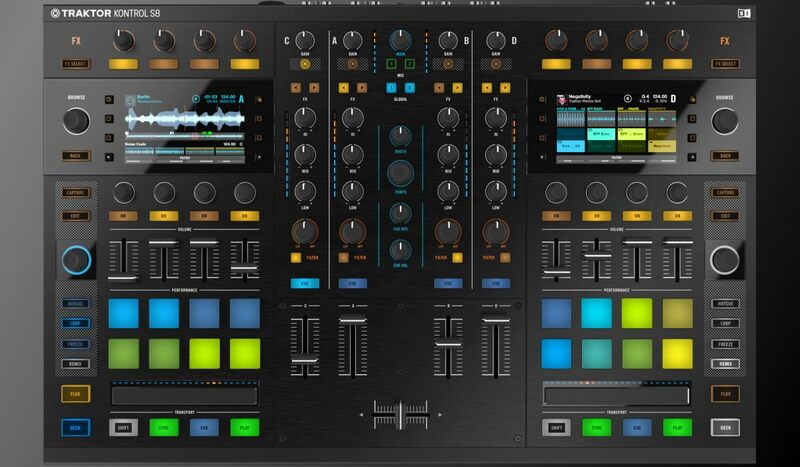 These screens are not the novelty they were in 2014, as many DJ controllers now carry them, but Native Instruments did a remarkable job back then to make them last, as they don’t feel outdated. The screens show, of course, all the relevant track related information you might want, from waveforms to the contents of your STEM tracks and Remix Sets. Also, when using the effects, the top part of the screen shows the selected effect and its parameters, which saves you a glance at your laptop screen when setting and using effects. Around the screens, there are several small buttons to control various aspects of your performance and the screens. For example, you can control the track’s BPM by using the browse knob, in 1/100 increments or by 1 BPM when using the shift key. Essentially, this is a way to get around the lack of a pitch fader, while at the same time allowing the DJ to fine-tune the pitch much more precisely than when using a pitch fader. Other functions include adjusting the screen’s brightness and the size of the waveform. 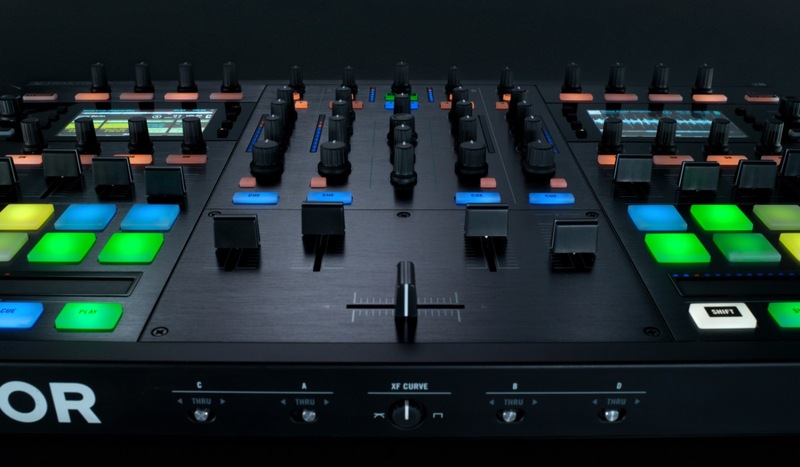 The deck faders are what make the Traktor Kontrol S8 stand out. The good news is that if you use them with STEM files, the experience is fantastic. Being able to silence parts of a track is a mind-blowing experience when mixing and it opens up endless creative possibilities. Unfortunately, you won’t find the latest hits as STEM files, simply because the music industry hasn’t adopted the format widely. The reasons why are evident: why would record companies put out their hits in formats that make it super easy to create remix versions that would be hard to get royalties from? You can find a serious selection of STEM files on Beatport, Juno, TraxSource and other sites, but these are mostly underground artists that don’t mind to sell their work in this format. If you are a producer that also DJ’s however, this format is a dream come true, because it allows you to remix your track on the fly, without having to use samples/multiple tracks to create live remixes. When using STEM files, you can apply effects to each stem individually with the dedicated knobs. 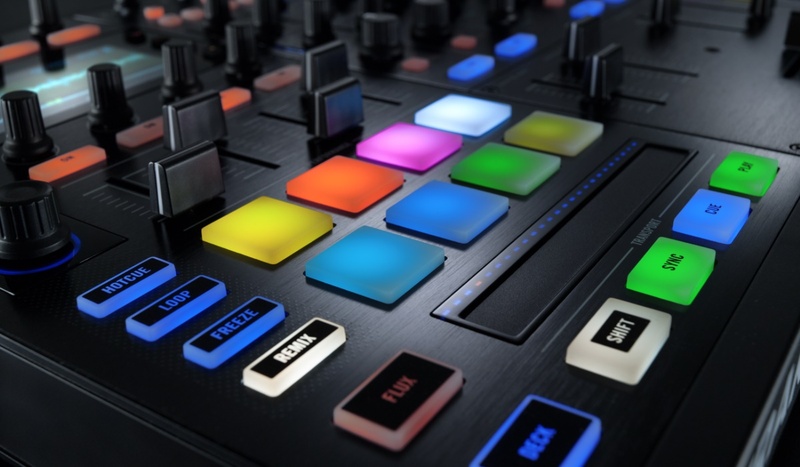 Lastly, the faders can also be used for playing with Remix sets, in combination with the performance pads. Finally, we come to the performance & transport section. The S8 has 8 high-quality, velocity-sensitive performance pads. 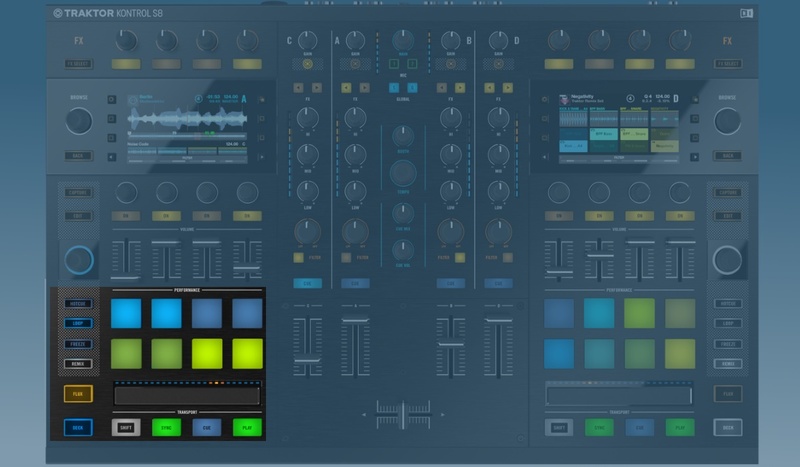 They unlock Traktor’s performance features: Hotcues, Loop, and Freeze. Freeze is similar to Slicer on Serato DJ Pro. The Flux button is the same as the Slip button on Serato and Rekordbox DJ controllers, and it can be used in combination with any of the above performance modes to execute tricks while the track keeps playing underneath. 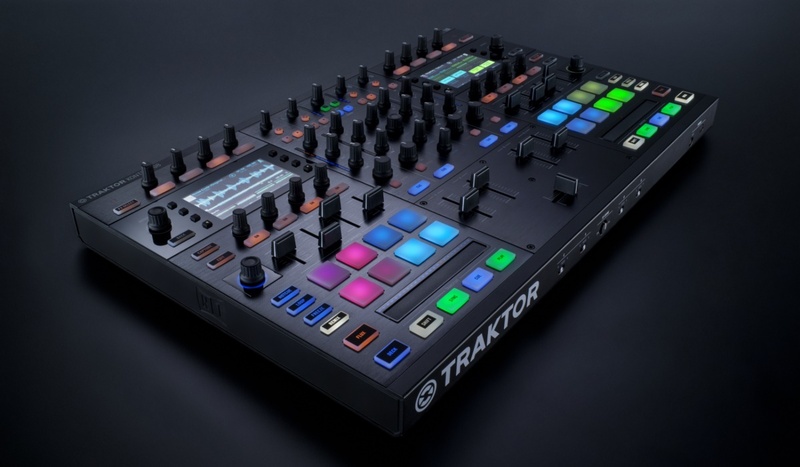 Overall Traktor offers fewer performance modes than Rekordbox DJ and Serato DJ Pro, but then again, if you don’t need more than this, what’s the point of having them. In my opinion, the modes available with the S8 are probably the most used ones and should be enough for most DJ’s. There is also a very cool touch strip, that can even be used for scratching (yes it does work, but is, of course, no replacement for a jog). Mainly, however, you will use it to nudge your track, and that works pretty well. You can also activate a “fast” mode using the shift button and skip through your track, with a led strip above the pad showing you the track position. The led strip acts as a phase meter as well. 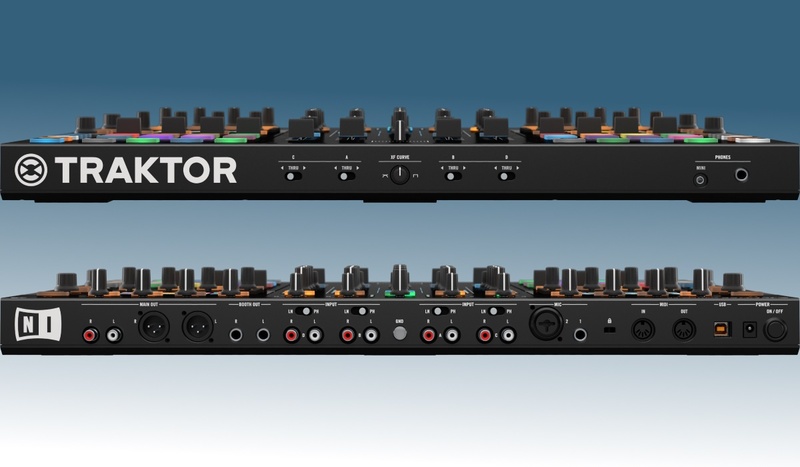 The mixer is a 4 channel, independent hardware mixer. A very cool feature is that when you are running Traktor Pro on it and other audio sources through one of the channels you can still use the Traktor Pro effects on that external source, which is quite cool. The mixer is, of course, DVS compatible. Add two turntables and timecode vinyl and you have a killer DVS setup, with the only drawback being that the turntables are far from each other due to the size of the S8. 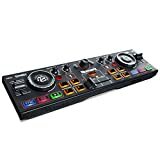 Each channel is well equipped with gain controls, 3 band EQ, filter (that also works in standalone mode), a cue button and a very solid line fader. Each channel can be set to Traktor or External mode, and decks C and D double as mic channels. Finally, each channel can be assigned to FX deck 1 or deck 2. The VU metering is very decent, with individual VU meters per channel and a master VU meter for monitoring the main output channel. In the center of the mixer, you will find the cue volume and cue mix, and of course the booth and master volume. Also, there is a large tempo knob, which might look out of place, but makes a lot of sense on a Traktor Pro controller. It allows setting the master tempo for all the decks. 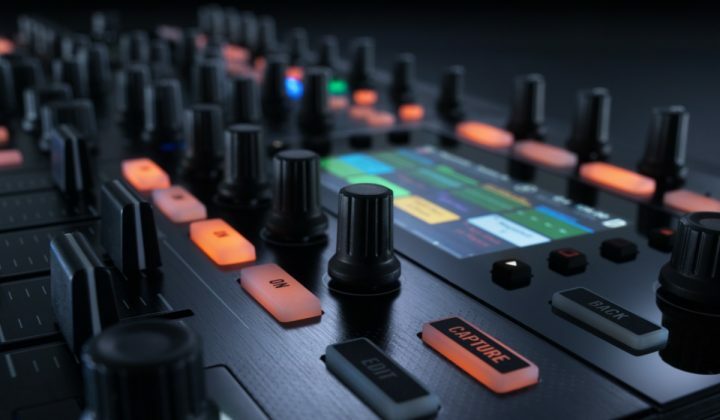 Since this controller has no jogs or pitch fader, the expectation is that it will be used mostly to play tightly beatgridded electronic music, and being able to control the master tempo from 1 single knob is actually pretty cool creatively. There are also Snap and Quantize buttons for tight looping and cueing. On the front the S8, there is a crossfader curve control knob and A/thru/B switches for each channel. I would prefer to see those on top, but that’s a minor thing. The S8 has a large array of inputs & outputs. There are RCA and XLR master outputs, and each channel has it’s stereo RCA inputs. There are 2 mic inputs, and not to forget, MIDI in and out ports. So, our original question was, is the Traktor Kontrol S8 still worth buying in 2019? 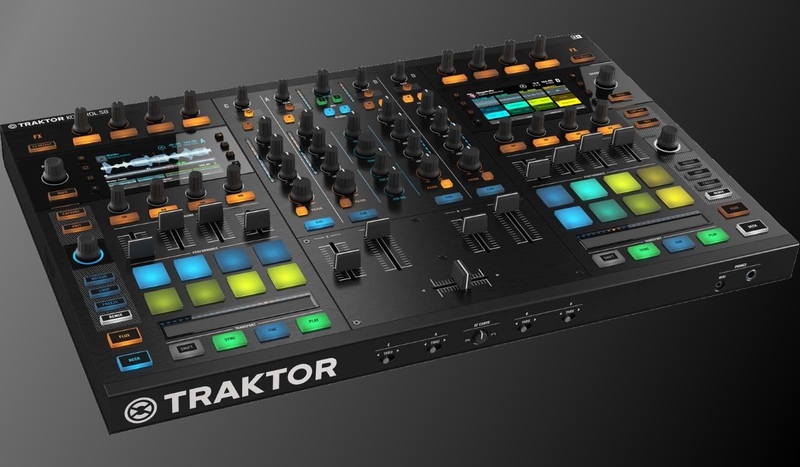 Sure, it’s more expensive than the brand new Traktor Kontrol S4 MK3, and it doesn’t have many of that controller’s new features. But it does what it does extremely well: mix electronic, tightly beatgridded tracks. So here is my take: jog wheels are not for everyone, neither are pitch faders. If you play electronic music, use a lot of samples, remix sets and stems, the S8 should be your weapon of choice. 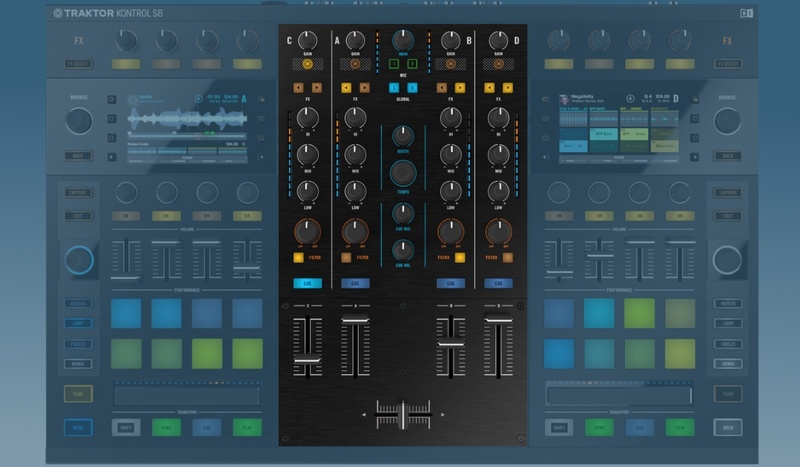 I expect Native Instruments to come up with an MK2 version soon though, so it’s very possible that the current price (USD 1199 at the time of writing) will go down significantly. The S8 is also fully supported in Traktor Pro 3, which means Native Instruments means to keep it in their product line for a time to come.